WITH OUR PATENTED AIR FILTRATION TOXICITY PREVENTION, WE WILL MEET ALL OF YOUR MEDICAL AND PRACTICAL ISOLATION NEEDS. PATENTED INVENTORS OF THE TRANSITION COVER AND PIPE COVER. LOOK FOR THE BACKPLASH PROTECTOR, COMING SOON! Where it all started: when you need a high quality, industrial strength, custom tarp. Whether its a floor, truck, boat, building, or mom and pop’s wood pile- we’ve got you covered! All sizes, colors, and materials are tailored to your specific needs, so contact us for a free quote today! Here at STC, we like to think we know a thing or two about fishing; it’s basically our second family business. 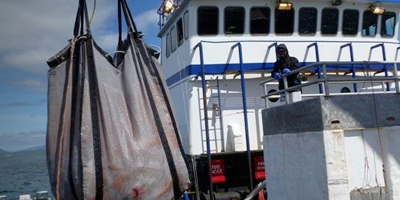 Designed with the fisherman in mind, we offer completely customizable slush, net, and Brailer bags guaranteed to fit your vessel, allowing you to maximize the use of your space and protect the freshness of today’s catch. A patented construction site safety solution. Flexible covers for your concrete pumping equipment help make your job site safe from common, and highly dangerous, equipment failures with boom trucks and delivery pipes. Side curtains on semi-truck trailers are a big deal! They allow the operator to access the contents of their trailers with ease and also protect the product inside. To make this possible, special manufacturers have to make these curtains, and Seattle Tarp leads the way! Portable isolation units are the new important advancement in first response and emergency preparedness. Developed with Virginia Mason Hospital of Seattle Washington, our variations of Iso-Chambers allow for rapid deployment, transportation, and isolation of potentially contaminated patients. As one of the very first Berm producers in the industry, we are committed to protecting the environment. Our Earth Guard portable and permanent spill containment products assist in meeting goals of the clean water act along with all SPCC requirements. We offer custom manufacturing for tarps, berms and other spill containment, starting from the beginning design stages, all the way to the final product. We assemble our products with industrial grade machines to ensure a quality well built product that will withstand harsh conditions. From grommets to support bracing, we offer industrial strength materials to meet and satisfy your needs. While offering a huge amount of materials, we also have them in the colors you want for your business or custom product. Have a damaged grommet, tear, or need something a little different? Send your products in to get repaired, or modified to fit your needs. Recycling high use products can reduce your costs significantly.